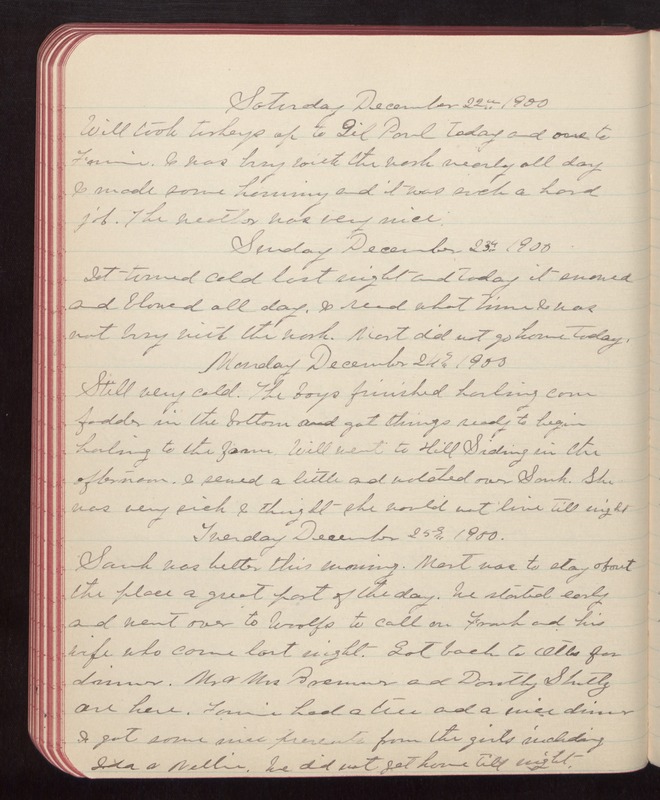 Saturday December 22nd 1900 Will took turkeys up to Gil Paul today and one to Fannie. I was busy with the work nearly all day I made some hominy and it was such a hard job. The weather was very nice. Sunday December 23rd 1900 It turned cold last night and today it snowed and blowed all day. I read what time I was not busy with the work. Mort did not go home today. Monday December 24th 1900. Still very cold. The boys finished hauling corn fodder in the bottom and got things ready to begin hauling to the farm. Will went to Hill Siding in the afternoon. I sewed a little and watched over Sarah. She was very sick I thought she would not live till night Tuesday December 25th 1900 Sarah was better this morning. Mort was to stay about the place a great part of the day. We started early and went over to Woolfs to call on Frank and his wife who came last night. Got back to Otts for dinner. Mr & Mrs Bremner and Dorothy Shultz are here. Fannie had a tree and a nice dinner I got some nice presents from the girls including Ida & Nellie. We did not get home till night.